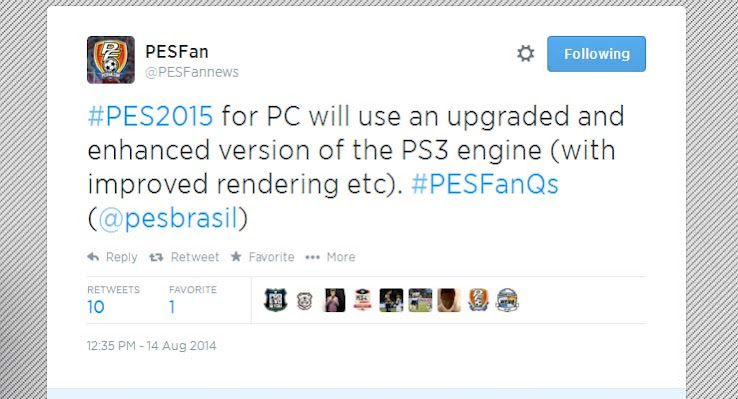 The PES 2015 PC version will use the PS3 engine of the game as a base and not be ported from the PS4 / Xbox One PES 2015 versions. This was just confirmed via a PES 2015 Q&A PES Fan are doing with PES Brand Manager Adam Bhatti on Twitter. This news comes as a huge letdown following the relatively good signs coming from the PES 2015 features announcements and gamescom gameplay videos. Adam Bhatti later posted two tweets trying to explain the reasons behind the decision to have an inferior PES 2015 PC version. According to Bhatti, gameplay and modes in PES 2015 on PC are same as on PS4 and Xbox One, while the visuals are only an improved version of what's on PS3 / Xbox 360. Given Konami's record of lying and making false promises, we'll probably only know what the game is like in terms of gameplay and graphics on release day. As we haven't seen and heard anything about the PS3 and Xbox 360 versions of the game, the statement that PES 2015 on PC is visually superior than on PS3 and Xbox 360 doesn't really say anything. As PES 2014 ran so badly on both old consoles, it's well possible the graphics have been scaled down immensely. Anyway, our focus has been bringing back the gameplay. I don't want threats or concern from PC users, judge the demo before shouting.